Two summers ago, my husband Jeremy and I decided to cancel our family’s cross-country road trip just days before departure. Our bank account had taken a beating with some unexpected bills. We suddenly found ourselves looking for staycation activities for our children, who were devastated to miss out on hiking the national parks and splashing in the ocean with their California cousins. Fortunately, several churches in our area offered Vacation Bible School programs,so we immediately set to registering Lydia, 9; Becca, 7; and Samuel, 4. You can’t go wrong with snacks, scripture, and slap bracelets for less than $15 per kid. Later in the summer, I was delighted to find yet another VBS in a neighboring town that offered a curriculum different from those of the previous weeks. 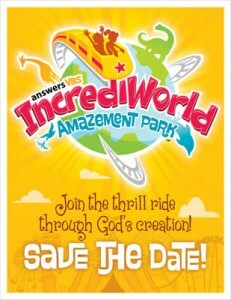 The program was called IncrediWorld Amazement Park: A Thrill Ride Through God’s Creation. Still pining for Yellowstone’s geysers and Black Canyon’s 2,000-foot, Precambrian drop,the kids welcomed a nature-themed week. When we dropped our kids off, Jeremy and I were struck by the warmth of the staff and volunteers. While the other VBS programs funneled children into the appropriate groups right away, this church stationed the pastor at the door. “What’s your name, Buddy? And how old are you?” he asked Samuel, crouching at his eye level and patiently awaiting an answer as if Samuel were the only child in the room. This church seemed to define itself with tenderness, and we felt comfortable entrusting our kids to them for a few hours each morning. At lunch after the first day, we asked the children what they had learned. “Creation stuff,” Lydia quipped, and tossed a chart on the table.Jeremy picked it up and squinted. The children had been asked to place a sun sticker on day one, a moon on day two, and so forth. The chart read, “In six short days, everything was made.” He and I exchanged a quick glance. The focus on six literal days surprised us, but we didn’t make too much of it, and the kids didn’t even seem to notice. We’ve taught them that while we don’t adhere to six literal days, many people do, and that in the context of following Christ, differing opinions are acceptable, even healthy. Our own church body represents a variety of views on the creation issue—if the subject even comes up. We’re usually too busy trying to feed and clothe teen mothers and gang members. Be open-minded and respectful, we tell our kids. Examine your beliefs, admit uncertainty, but don’t lose sight of what’s—or who’s—most important: Jesus. On the second day, as Jeremy and I drove the children home, we learned they had participated in a role-play activity. “So, like a scientist guy stood on one side of the stage, and a Christian on the other,” Becca said. Our kids explained how the two characters debated about the age of the earth, and then the students, aged preschool through fifth grade, were asked to stand on one side of the room if they agreed with the scientist and the other if they sided with the believer. There was, literally, no middle ground. And still no mention of Jesus. “Where’d you stand?” I asked. Panic rose in my chest, but I decided to keep quiet until Jeremy and I could speak privately. When the kids went outside to set up their Slip-n-Slide, we flipped through the morning’s items. We hold the Bible in high regard in our household and have read it to our kids since their births. But I find the statement dangerous. What do the writers mean by says it? Are they accounting for genre and cultural context? Certainly this church doesn’t take head coverings and stoning disobedient children literally (or they would never be able to run a VBS). We want our children to linger in the mysteriously, often beautifully, gray it of the word, not read a verse, slam their Bibles closed, and wipe the dust from their hands. “What do you think?” I asked Jeremy, but we both knew the answer. Tania Runyan is the author of the poetry collections Second Sky (Cascade Poiema Series), A Thousand Vessels, Simple Weight, and Delicious Air, which was awarded Book of the Year by the Conference on Christianity and Literature in 2007. Her book How to Read a Poem, an instructional guide based on Billy Collins’s “Introduction to Poetry,” was recently released by T.S. Poetry Press. Her poems have appeared in many publications, including Poetry, Image, Books & Culture, Harvard Divinity Bulletin, The Christian Century, Atlanta Review, Indiana Review, and the anthology In a Fine Frenzy: Poets Respond to Shakespeare. Tania was awarded an NEA Literature Fellowship in 2011. She tutors high school students and edits for Every Day Poems and Relief.